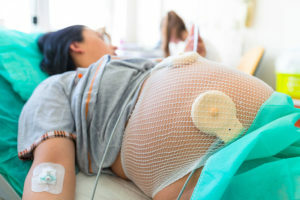 C-sections are often associated with an emergency, but it is becoming increasingly common for women to plan a C-section birth from the beginning of their pregnancy. A C-section birth involves making an incision into the stomach and uterus to remove the baby. There are certain situations that make a caesarean necessary such as eclampsia, separated placenta or when the baby is lying transverse. Breech delivery, stalled labor or multiple births are also factors that may require a C-section. If you know that you are going to have a C-section, it can be very helpful to know what you should expect before, during and after the procedure. 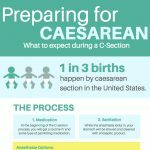 How Do You Prepare for a Caesarean Section? If you are not planning on giving birth vaginally, your birth preparations may be a little different than you originally expected. Before a C-section, you should expect some additional tests to determine your blood type (which is important especially in the case of an emergency), blood draw, control of heart sounds and contractions. You might sit down with your doctor to discuss anesthesia and incision preferences. If the C-section is planned to be before 39 weeks, you may need an amniocentesis to check the lung maturity of your child. This helps to ensure that the C-section is not accidentally done too soon. Besides bathing with antiseptic soap before going to your C-section, you do not need to shave or do anything else to prepare physically. However, it may be beneficial to prepare for household help and other assistance after the C-section because you will be tired from the birthing procedure. At the beginning of the C-section process, you will get a routine IV and some type of painkilling medication. Typically, C-section anesthesia is an epidural that allows you to remain conscious without feeling anything in the lower half of your body. However, some women do prefer general anesthesia that makes them completely unconscious. While they wait for the anesthesia to fully numb you, your stomach will be shaved and cleaned with antiseptic products. Then you will be taken to a sterile operating room where your birthing coach or partner might be present. Typically, the doctors will place a small screen at the top of your stomach, so that you do not have to watch them making the incision. First, they will open the skin, and then they will open the uterus. A C-section incision will either be a horizontal cut across the lower stomach or a vertical incision down the middle of the incision. Depending on which surgical technique is used, there are differences with regard to how adipose tissue, muscles and fascia are severed. During all of this, you may feel some pulling or tugging if you are still conscious, but you will not feel pain. The baby will be removed, and if you did not have general anesthesia, you will get to see and hear your baby as soon as it is delivered. Once the umbilical cord is cut, the doctors will work to close the incisions with sutures. What Is It Like to Recover From a C-Section? Typically, C-section recovery takes slightly longer than recovery from a vaginal birth. Both you and your child will stay in the hospital for three or five days while recovering from the experience. To manage the pain from the surgery in the first few days, you might be given IV pain medication. During this time, it may be difficult to move around, but you will still be able to have plenty of time getting to know the newest addition to your family. However, your midwife or doctor will suggest you take the first steps as soon as possible to speed up the healing process. Right before you go home, the stitches or staples will typically be removed from the incision. Once you go home, you will need to rest a lot, avoid any physical activity, drink a lot of fluids, possibly eat a liquid diet and continue to take pain-relieving medication. During this first period of time back home, housework and the lifting of heavy objects are typically not allowed. During this time, keep an eye on the incision area to make sure it is not showing any signs of infection. After a couple weeks, you will normally need to go to the doctor for a check up. As long as your incision site is healing fine, you will probably be able to start moving around again by this point. Six weeks after the C-section, you will most likely be completely recovered from the experience.